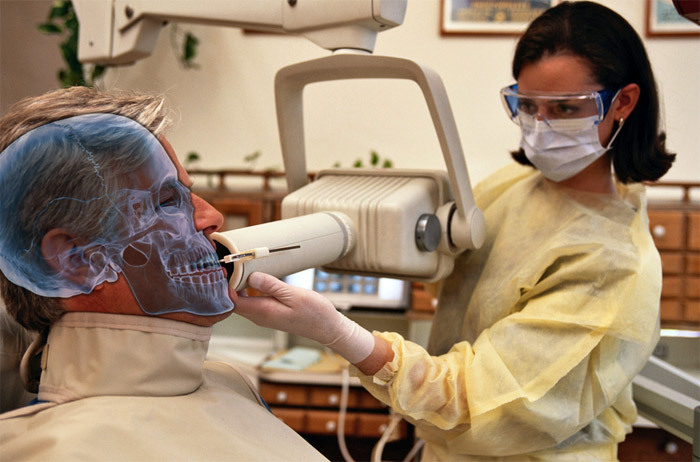 Dental radiographs are images that help detect problems, when present, that the eyes cannot see. 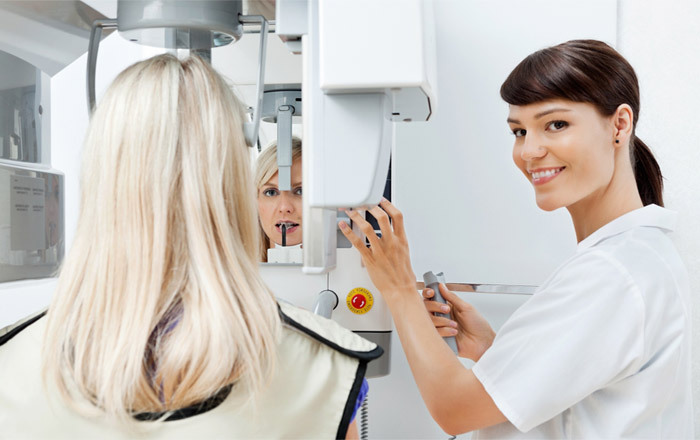 Dentists use x-rays to look for cavities, bone loss in periodontal disease, chronic infections, benign or malignant masses in the jaws, or hidden dental structures such as wisdom teeth. Dental x-rays are an essential tool to complete an oral exam as visual screening does not locate and diagnose hidden disorders. X-rays therefore help detecting oral issues in a person’s mouth before they become major problems. Teeth and their surrounding tissues are made of different substances, each having a different anatomical density. When a region of the mouth is subject to a radiograph, x-ray radiations enter those structures at different levels, depending of the densities. 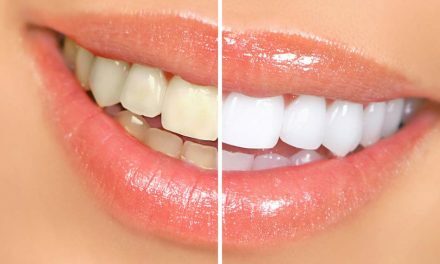 Teeth structures (enamel and dentine) as well as bone, all appear more white, at different levels, because less x-ray radiation enters them. Oral infections, cavies, and some normal structures such as the pulp or the periodontal ligament, all appear darker on a radiograph because these less dense materials are more penetrated by radiation. 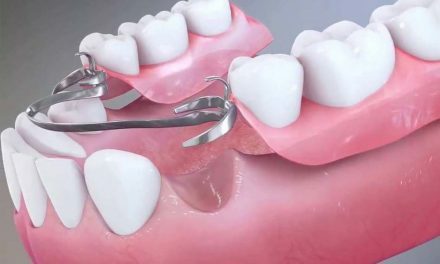 Dental materials such as fillings, crowns, or root canal treatments, may have different densities depending of the material, and their appearance is variable. 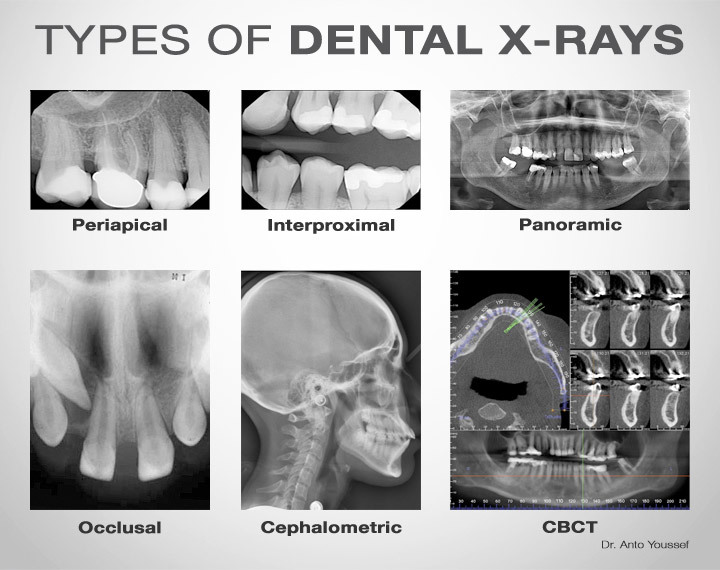 There are many types of x-rays that can help the dentist complete an oral exam. Each can have a purpose in analyzing a precise area of the mouth or the surrounding structures. An x-ray can be intra-oral, if the film or sensor is placed inside the mouth, or extra-oral if placed outside. Periapical x-rays show the entire tooth (or group of teeth), including its root. These x-rays are used to analyze the structures under the gum line, comprising the bone and the root tip (apex). They can mostly detect periodontal disease and infection of a tooth that may need root canal treatment. They can also reveal impacted teeth, as well as abscesses, cysts, and rarely tumours. Bitewings are x-rays that are used for back teeth (premolars and molars). 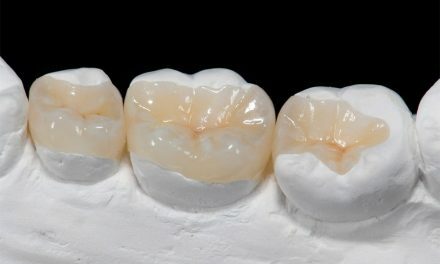 In a single view we can see upper and lower teeth, but the natural crowns only. These x-rays are useful to detect cavities in between teeth, or cavities that start under old fillings or crowns. Sometimes we can perceive bone loss and periodontal disease with bitewing x-rays. Occlusal x-rays show a group of teeth aligned on either the palate or the floor of the mouth. They are used to detect pathologies such as impacted teeth, surnumerary (extra) teeth, abscesses, cysts, clefts, or even foreign objects. Panoramic x-rays (or panorex) are taken extra orally and show a broad view of all the teeth, the jaws, the joints, and the sinuses. 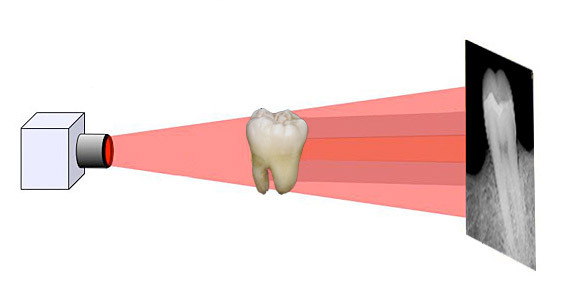 Panoramic x-rays can detect periodontal disease, impacted teeth, infections, fractures of the jaws, cysts and tumours. Cephalometric x-rays are mostly used in orthodontics. They are extra-oral images of the whole cranium. Their study determines the relation between the teeth and the jaws in order to plan the orthodontic treatment. Cone-beam computed tomography (CBCT) is a type of radiograph that creates three-dimensional images of a certain area of the mouth. 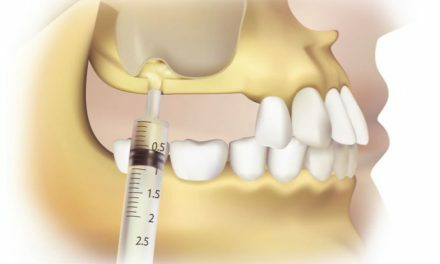 Those images provide very precise dimensions, and may be used when planning the placement of dental implants, or a difficult root canal procedure. Originally, radiographs were printed on film. That technology existed for medical purposes since the 19th century. In dentistry, a film was placed either inside the mouth or outside, and the structure that needed the radiograph was between the film and the source for x-ray radiation. The film was later placed in chemical solutions for the image to appear. In the 90s, photography, as well as x-ray imaging, were all taking a shift towards the digital technology. 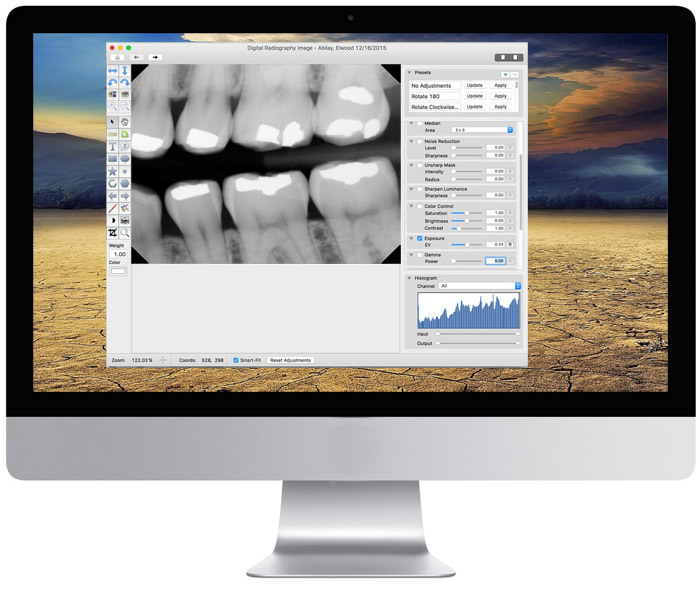 Today, most dentists have acquired digital radiography in their clinics. The concept is similar, except that the film is replaced by a sensor or a plate that is connected to the computer. The image appears on the computer screen and it can be saved. the image is stored in the computer and can be easily transferred to other dentists when needed. When deciding of the frequency of taking x-rays, we must consider what is the existing risk of cavity of the patient. A person who is at high risk of getting tooth decay is recommended to take more frequent x-rays than a person who is at low risk. Also we must consider that children’s teeth usually can get cavities more quickly than adults teeth. Therefore for children who are at high risk of getting cavities, they are recommended to have intra-oral x-rays every 6 to 12 months. But if they are at low risk, x-rays should be taken every 1 to 2 years. For adults who are at high risks, intra-oral x-rays should be taken every 6 months to 1½ year. If they are at low risk, x-rays every 2 to 3 years should be sufficient. Panoramic x-rays are recommended every 3 to 5 years. Of course all the above frequency recommendations can be modified depending on many situations and this can be discussed with the treating dentist. Are x-rays safe during pregnancy? For a long time, dental radiographs were avoided for women who were pregnant in order not to cause harmful effects in a developing baby. But research shows that with dental x-rays, there is almost no radiation exposure to any part of the body except the mouth. As reported by the American College of Radiology, no single diagnostic x-ray, of any part of the body, has a radiation dose significant enough to cause adverse effects in a developing embryo or foetus. The majority of dentists prefer to delay routine radiographs until the pregnant mother has given birth. They also try to avoid taking x-rays during the first trimester of pregnancy. But if there is a dental problem, taking one or two x-rays of the concerned tooth is not a risk at all. When there is a dental problem, not getting an x-ray can harm the mother’s health much more than it can harm the baby, and a healthy mom means also a healthy baby. The amount of radiation from dental x-rays is extremely small compared to every day normal radiation exposures. Dentists are still careful when they choose to take x-rays in order not to expose patients unnecessary to radiation. Digital radiographs have a big advantage in a way that the technology allows to reduce the amount of radiation while still achieving good quality images to analyze. BabyCenter (Is it safe to get an X-ray while I’m pregnant?). HealthxWellness (The Importance of Dental Care During Pregnancy). NextFor which sports should you use a mouthguard?